> Solar Energy>How much it will cost to install solar panels on your house? To answer the question of how much it costs to install solar panels on a house we look at what elements are components of a solar system. Thus we see how much it actually costs a solar kit. We will take the elements that allow us to have a solar system that makes us save about 90% of the energy we consume per year. The first element is solar panels, or photovoltaic panels. Prices vary according to brands and models, and will depend on the quantity purchased. If you want to perform an installation of medium size, as we are using the example, you must select panel size of at least 200 Wp (Wp stands for Watt peak and is the power unit of the PV modules) per unit to save wiring and connections. 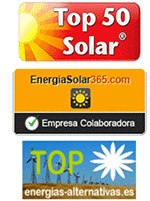 For example, a panel, tier 1 (Made in Germany) 250 Wp, out for less than 300 euros [link to https://tienda-solar.es/en/solar-panels/photovoltaic-panels/solar-panel-solarworld-250wp.html]. Given this module first brand, we can have a 1 kW of PV modules by slightly over 1,000 euros. To understand the real cost of this technology, we can check what 1 KW of photovoltaic produces. The annual production per photovoltaic kW in Spain can be around 1,300 kWh (may be higher in areas with high irradiation). The annual consumption of the average Spanish household is 3,500 kWh. With only 2.7 kW (less than 3,000 euros in modules) we can generate as much energy as an average Spanish household consumes annually. Of course that energy costs less than € 3,000, but we pay every year. Instead, photovoltaic modules have an estimated life of about 30 years. For a sunny location, southern half of the peninsula, with 2.25 kW would cover 90% of the average household consumption. That is, with 9 solar panels of 250 Wp, would form a solar kit that can generate 90% of the electricity we consume in a year. The inverter is the element responsible for transforming electrical energy in the form of direct current (DC) generated by the solar kit in electric power as alternating current (AC), which can be used in any appliance at home. The possibilities are endless as is the case with the solar panels, [link to https://tienda-solar.es/en/inverters/] Depending mainly on whether we are connected to the mains or if we are isolated from it. For normal power a home, between 3.5 kW and 5.5 kW, prices vary between 1,500 and 3,000 euros. This is the second most important element, and it is very important that the configuration was adequated; between the solar panels and inverter kit, and between the inverter and batteries, if necessary. We have a large storage that allows us to secure several days without sun. We have moderate storage that allows us to keep the production of the day to night. In this case, ensuring we have supply in any situation is an auxiliary power: for example, a gasoline generator, usually in an off-grid dwelling; or conventional power grid itself, but also reducing the contracted power. This solar kit allows us to be self-sufficient for many years of our own energy, using the grid only as insurance in case of lack of sunshine; we save in our variable term from the utility billing (as we consume much less), and the fixed term, allowing us to reduce the contracted power.